Tosafist; lived in the twelfth century. He was a disciple of Jacob Tam, with whom he carried on an active scientific correspondence, and was one of the members of the assembly presided over by him. 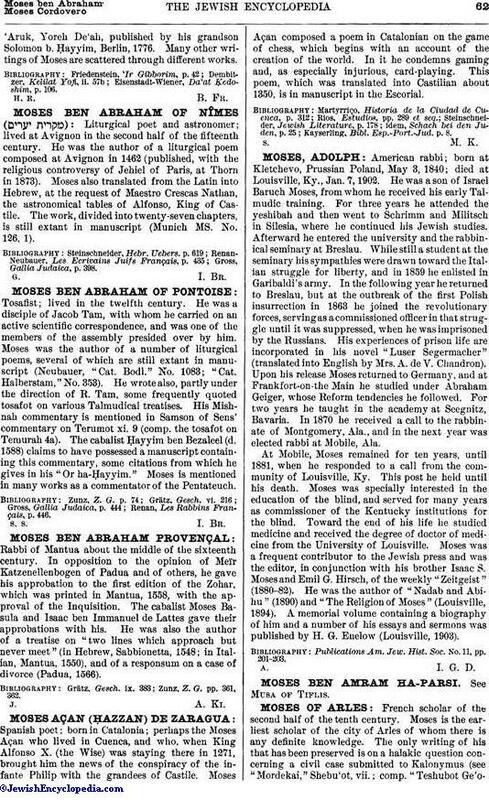 Moses was the author of a number of liturgical poems, several of which are still extant in manuscript (Neubauer, "Cat. Bodl." No. 1083; "Cat. Halberstam," No. 353). He wrote also, partly under the direction of R. Tam, some frequently quoted tosafot on various Talmudical treatises. His Mishnah commentary is mentioned in Samson of Sens' commentary on Terumot xi. 9 (comp. the tosafot on Temurah 4a). The cabalist Ḥayyim ben Bezaleel (d. 1588) claims to have possessed a manuscript containing this commentary, some citations from which he gives in his "Or ha-Ḥayyim." Moses is mentioned in many works as a commentator of the Pentateuch. Renan, Les Rabbins Français, p. 446.